Each year when back-to-school season comes along, parents face the same dilemma -- what to pack kids for lunch. You want to pack healthy foods, but most pre-packaged, convenience items are high in calories, fats, sugars, and artificial ingredients. But with a little knowledge and planning, you can send your kids to school each day with a well-rounded, healthy lunch they'll enjoy. Kids' lunches should be balanced and offer a variety of foods from different food groups. This gives them the energy and focus they need to make it through the long school day. 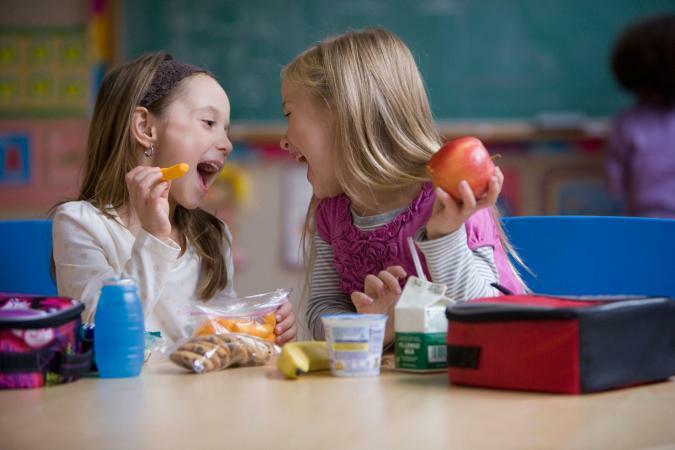 KidsHealth from Nemours recommends including a starch, a protein, fruits and veggies, and a dairy food in each lunch. For the healthiest lunch possible, choose organic foods, low-fat dairy options, and nitrate-free deli meats. If your school has a peanut butter ban, substitute with another approved butter, like SunButter, in recipes that call for peanut butter. To keep things well-protected and separate, use divided containers or a kids' lunch kit. Instead of putting meat on white bread, add it to a whole-grain tortilla. Slather the tortilla with mashed avocado or mustard. Add deli or cubed chicken breast, turkey breast, or ham. Place a slice of low-fat cheese on top of the meat. Add tomato slices and a lettuce leaf. Roll-up and cut in half. Pack with 1/2 cup apple slices and 1/4 cup cherry tomatoes. Your child can top each tortilla chip with a little meat, cheese, and tomatoes/salsa to create the perfect nacho. Serve with a side of grapes and fresh veggie sticks with low-fat ranch dressing for dipping. Prepare the batter from one box honey cornbread mix. Spray muffin tins with cooking spray and fill 2/3 full with batter. 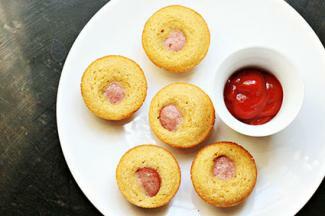 Place a generous piece of nitrate-free hot dog or tofu dog in the middle of the batter. Bake according to cornbread instructions. These freeze well so you can make a big batch and grab one or two for lunch as needed. Pack ketchup or barbecue sauce for dipping, a cheese stick or cheese chunks, carrot sticks, and 1/2 cup fresh fruit. This is a no-fuss healthy lunch for days when you are pressed for time. Soak four thick apple slices in apple or lemon juice. Slather natural almond or other nut butter onto one apple slice. Top with raisins or granola. Place another apple slice on top to form a sandwich. Repeat the process for a second sandwich. Serve with a cheese stick, celery sticks with a little extra nut butter for dipping, and whole-grain crackers. Pack with 1/2 cup fresh fruit, and 1 cup air-popped popcorn sprayed with olive oil cooking spray and tossed with a teaspoon of cinnamon-sugar or Parmesan cheese. This sandwich is a great way to get kids to eat their veggies. Slice a peeled or unpeeled, medium-sized cucumber in half; then slice each half lengthways. Top a cucumber half with 1 tablespoon of low-fat cream cheese, 1 slice of ham and 1 slice of cheese. Top with another cucumber half. Repeat to create two sandwiches. For smaller appetites, slice each sandwich in half. Pack with a handful of baked tortilla chips or 1 cup air-popped popcorn and 1/2 cup fresh fruit or natural applesauce. 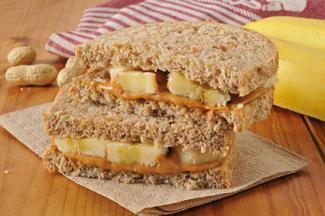 If your child loves peanut butter, this sandwich takes it to the next level. Spread 2 slices of whole-grain bread or tortilla or a brown-rice cake with natural peanut butter. Top 1 slice with organic honey and several banana slices. Put the second slice of bread on top of the other. Serve with low-fat yogurt or a cheese stick and sliced carrots and celery sticks with low-fat dressing for dipping. Whole grain silver dollar pancakes are the perfect size for your child's lunchbox. Make a batch ahead of time and store them in the freezer until ready to use. You can do the same with whole-grain waffles. Pack 4 pancakes with a small container of pure maple syrup or honey for dipping. Include 2 to 3 slices of nitrate-free bacon or 1/4 cup diced ham. Also add 1/2 cup fresh fruit to the lunch. 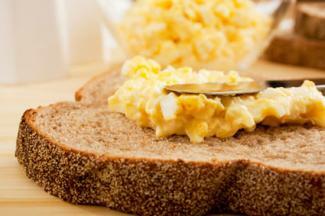 If your child has a large appetite, add a hard-boiled egg. Ask any kid what their favorite food is and many will answer pizza. Send your child to school with the ingredients to make a mini-pizza. Cut two, 4-inch circles from whole grain pitas. Pack with about 2 tablespoons marinara sauce or diced tomatoes. Add 4 tablespoons shredded, low-fat mozzarella cheese to the lunch. Include 2 to 3 several slices of nitrate-free traditional pepperoni or turkey pepperoni. If your child likes vegetables, you can also include diced mushrooms or bell peppers. Add carrot sticks with hummus or low-fat dressing for dipping and 1/2 cup fresh fruit. Your child's age and appetite will drive how much food you pack each day. Feel free to increase or decrease serving sizes accordingly, but caution your child to only eat until full. If you choose to pack dessert, try a square or two of dark chocolate, a homemade oatmeal raisin cookie made with applesauce instead of oil, or homemade dehydrated fruit leather. Kids have their favorite foods, but most will try new things. It's important to educate kids that healthy doesn't mean gross and help them develop a palate for foods good for them. Let them help create their weekly lunch menu and do the grocery shopping together. Talking about a healthy diet at a young age helps kids create healthy eating habits that will last a lifetime.